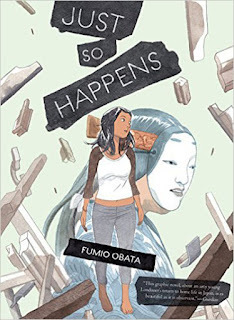 Fumio Obata's Just So Happens was published last year in the UK and back in March here in the US, but I only just stumbled across it in the bookstore. The story is about a young Japanese woman, Yumiko, who moved to England about a decade ago. She's got a decent life, living with her fiancé and working as a designer in London with some of her friends. But early in the story, she gets a call from her brother saying that their father just died in an accident. The story then follows Yumiko as she heads home, visiting with family, and dealing with her father's funeral. It's a quiet story. Much of the dialogue is in Yumiko's head, and there are some extended passages that are basically just dreams. In and among the funerary traditions she sits through, she finds herself thinking back to a Noh theatre rehearsal she stumbled across several years earlier, likening the almost robot-like precision of the actors' movements to the individual elements of the funeral services. It's about removing the actors so completely that one can find comfort in the utter predictability of the actions. The flip side of that, however, is the loss of individuality and free will. The prescribed actions set out by the script are, by design, meant to completely subsume the actor's very identity. It's this aspect that Yumiko seems to have nightmares about. And it's only while visiting her mother afterwards (her parents had divorced years earlier, and her mother did not attend the funeral) that Yumiko destroys the entire theatre in her dream. Yumiko struggles throughout the story between her two worlds: the Japan where she was raised and has family, or the England where she created a life of her own. But the question she also has is: is this new life she created really just the dream her mother sought? She continues pondering that question on her trip back to England and, only after collecting her luggage and walking through the gate, does she really reconcile her feelings. Obata has an incredibly light touch with his storytelling. Almost nothing is told in explicit detail, and it makes readers a very active participant in the story as they suss out the inferences. Even the resolution isn't very overt -- we don't see her greeted by her fiancé or anything obvious; Yumiko just blends into the crowd at the airport. It's a refreshing change from many commercial stories that spoon-feed their audiences. There was nothing here I had to work hard for -- all the pieces are there -- but I still had to work a bit to assemble them for myself. And I think that's a strength of the work. The light linework and watercolored hues also speak to the subtlety of Obata's work as a whole. With the exception perhaps of one double-page spread, there's nothing visually splashy in the book and even that one spread is somewhat muted with a nearly monochromatic palette. Every aspect of the story here -- the art, the writing, the storytelling -- serves to compliment one another, and heighten the reader's interpretation of the story as a very reflective, contemplative one. The book highlights the difficulty in navigating one's own path against familial traditions. But while it does somewhat play off the notion of race, it's not treated as an alienating factor. Rather, it's just different sets of cultural mores that cause Yumiko's agita, not really any notion of race as we generally consider it. Yumiko's life in England has little overlap with her family in Japan, so the only code-switching she really needs to concern herself with occurs gradually during the 12-hour plane ride. It's not two cultures she's struggling to reconcile, but two identities. Which means that the story can be read more broadly -- "who am I really" versus "who am I acting like to cater to my family's expectations". I think it's that aspect that resonated most with me. I'm not Japanese, I'm not a woman, my parents are still alive and married, I haven't translocated to a country that speaks a different language than what I grew up with... But I still very much understood the struggle of identity. And while I think that's a question I've largely resolved for myself, it's hard not to appreciate the subtle beauty of how Obata handles it here.